We also specialize in providing highly efficient Energy Management Systems. Our company has created niche in the field of offering Street Lighting Control System to the clients. Street Lighting Control System is accurately manufactured under the stern guidance of adroit professionals using quality-approved raw material and advanced techniques under the proper guidance of deft technocrats in line with set industry quality standards. Offered range is available to clients in various technical specifications to fulfill their various needs. This product is stringently checked by the quality auditors on well defined parameters. We offer a comprehensive Energy Monitoring System software which is appropriate for Industries, manufacturing plants, commercial buildings or any situation where an electrical system is used. 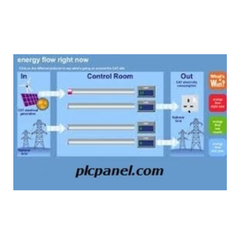 This system provides a centralized Power Monitoring and Control facility. Do you want to meter the water consumption in a large area ? In a city ? Are you looking for making a Smart Industry and / or a Smart City ? We have Reliable and Accurate top of line Meters for Water, Gas and Electricity which will communicate over EXISTING power lines thus saving on OPEX and CAPEX both. You can alternatively communicate the data thru our very reliable and tested RTUs and get all the data needed to save money and optimise your energy costs and availability.